It is almost pointless in writing an article about Russell Brand. Opinions are so divided about him that his haters seem to eat up every criticism of him no matter how stupid while his supporters seem to shrug off any criticism as if it’s all some grand conspiracy. I’m not a Russell Brand fan, and at some point I may well bore on at length about why. For now though, I’m going to focus on his latest spat on Channel 4 News with reporter Paraic O’Brien. Outside 10 Downing Street where Russell Brand was presenting a petition with residents from the New Era estate in protest at Westbrook Partners buying up their homes, O’Brien pressed Brand over his own living arrangements. An visibly irritated Brand evaded all questioning on the matter, pulled a protester into the shot to defend him and then stalked off, calling O’Brien a “snide”. So far, so predictably divisive. Brand’s critics will leap on this as evidence of his hypocrisy, Brand’s supporters will attack it as the media attempting to discredit it so as to continue their neoliberal agenda. Yet the fact is that if you watch the full report shown on Channel 4 News, it by no means focused on Brand. Instead, it was a genuine attempt to draw out the bigger picture. Leaving aside boring accusations of hypocrisy, the fact is that London’s inflated rental market is the real story here, making Russell Brand’s own living arrangements relevant. These wider issues are now struggling to gain attention, with Russell Brand’s behaviour in front of a camera once again dominating the story. Okay, maybe it lacks a certain Russell Brand panache. Indeed, the fact it is a little dull is kind of the point. Of course, this practice of staying on message is exactly the sort of thing politicians do. I can understand that might feel that indulging in such practices would be to play the media game. But it seems to me that if you want publicity (and he could quite easily evade publicity if he wanted) you have two choices: play the game or get played. The latter is what seems to be happening. Unless it was Brand’s intention all along to steal the limelight from the New Era residents, he can’t possibly be happy with the press his interview has garnered, which relegates the actual issue to paragraph 8. If he’d kept his calm, the New Era protestors might have been deemed less newsworthy, but at least it wouldn’t have been used simply to deflect attention away from the actual issue. Of course, all this assumes that Brand actually believes there is a wider picture about London housing, and that the New Era estate controversy is the part of something greater and not just a unique story about corporate greed. Even leaving aside the tactics of it all, one thing I don’t understand is how it squares up with Brand’s own calls for greater spirituality. Because surely the spiritual answer to “are you part of the problem” is always “yes”? Surely the solution always starts with the individual? Yet despite hearing Brand talk endlessly in abstract about how we are all one, and that our egos, greed and selfishness ultimately only work against us, when it comes to politics, he only ever seems to talk about Them vs Us. I’m genuinely mystified about how he can reconcile the two, because on the surface of it his political agenda is less spiritual than the most cynical Westminster hack. Perhaps I should read his book, but by all accounts it won’t actually answer my question. I have a bad habit of dismissing games based on the fact that they sound boring, only to go onto try them and love them. This years was particularly bad as I first dismissed Splendor, fell in love with it, was furious when is failed to win the Spiel Des Jahre, which went to Camel Up, a game which I also thought sounded lame before playing it and realising it totally deserved the award. The thing is, until you try games out, you never know which ones you’re going to love and which ones will send you to sleep. And you never have enough time to test them all out, which can be very frustrating. This, in a nutshell, is the theme of Alchemists, another game which didn’t interest me when I first heard about it but which I am happy to report is an excellent addition to my collection. In Alchemists, you play an alchemist working in a medieval university attempting to discover the essential nature of the eight “alchemicals” – ingredients which you can use to make magical potions and poisons. At the heart of the game is a concept which will be very familiar to players of logic puzzles and, er, Cluedo. When you test two ingredients together they will either result in producing a “positive” potion, a “negative” poison, or a very tasty soup which does nothing whatsoever. You understand the underlying alchemistry (is that a word? It is now) behind it all and so the more information you have, the more you can narrow down the possibilities about each ingredients’ essential qualities. If you had the time and resources to test all the ingredients, fame and academic prestige would be all yours. But you don’t have the resources, and you have a number of rivals each trying the same thing. At the heart of the game is a phone app which you use to test the ingredients and a number of other actions. Board games which rely on apps (as opposed to apps which keep score or replace basic functions such as rolling dice) are quite a new thing – as far as I know only Alchemists and the upcoming XCOM board game have taken this step. They’re controversial as there are concerns that it is just a gimmick. 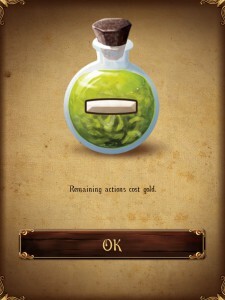 While this possibility is not inconceivable, I can say that with Alchemists it adds a new dimension to the game which wouldn’t be possible without the app. The game is in fact playable without the app, but it relies on having one person play a facilitator. It’s clear that the app opens up new possibilities for gameplay, which is why this game feels so fresh. Probably the best thing I can about the app is that it doesn’t get in the way. It’s straightforward to use and allows you to concentrate on the game itself (I suspect having a human facilitator would be far more intrusive). The best aspect of this game is the way it parodies academic life. The goal of the game is to finish with the highest academic reputation, but that’s an ephemeral thing. You can concentrate on research, but will quickly find yourself cash strapped. You can sell out and flog your potions to passing adventurers for their own nefarious purposes, but risk your reputation. 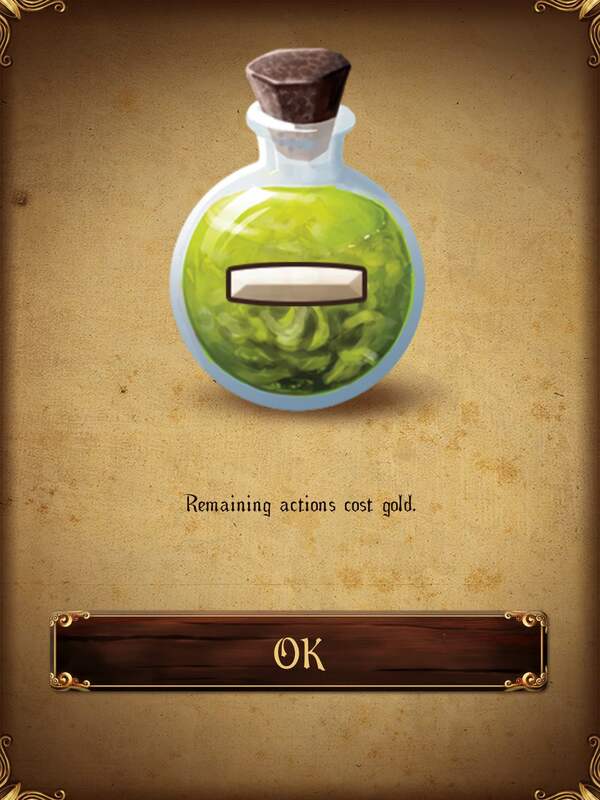 Most research is done by exploiting students, but if you poison them then they demanding money; you can test potions on yourself for free, but that means you have to suffer all the negative consequences if they turn out to be poison. If you don’t publish enough theses before the two academic conferences in the game take place, you will lose reputation and you can gain reputation by debunking your rivals’ theses. You can spend the game riding the coat-tails of the players doing the real research and do very well for yourself. Both times I’ve played it, I’ve found myself getting extremely caught up in the theme. Indeed, the way the theme and the game mechanisms mesh – aided by the app of course – is remarkable. While it takes a while explaining the logic behind the alchemicals and there are some basic rules that need explaining, once you get that out of the way it really is a very smooth game to play. Not all the rules need to be learned in round one, which means you can progressively explain them as they come up. For a game with as many moving parts as this one has, that really is something. Before I get too hung up on the game’s brilliance, I do have a couple of criticisms. The pieces you use to keep track of the results of your various experiments don’t fit into the board they are intended to be inserted into. There’s a knack to wedge them in, but a lot of players seem to really struggle with them. Fortunately, the publishers CGE have announced that they will be replacing these with slightly smaller counters. A bigger issue however are the pads which you are supposed to record your results on. The various symbols on these are quite small have been faded out. I struggle to see them clearly, and my partially sighted wife has a real problem. I plan to mock up my own laminated versions soon. These production niggles however don’t interfere with what is a really great game which, while having some very familiar mechanics feels remarkably fresh and original. 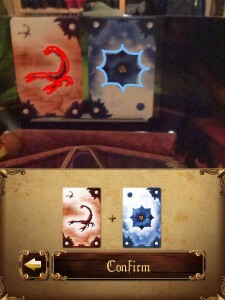 The theme and app make it surprisingly accessible for a game of this length and complexity. 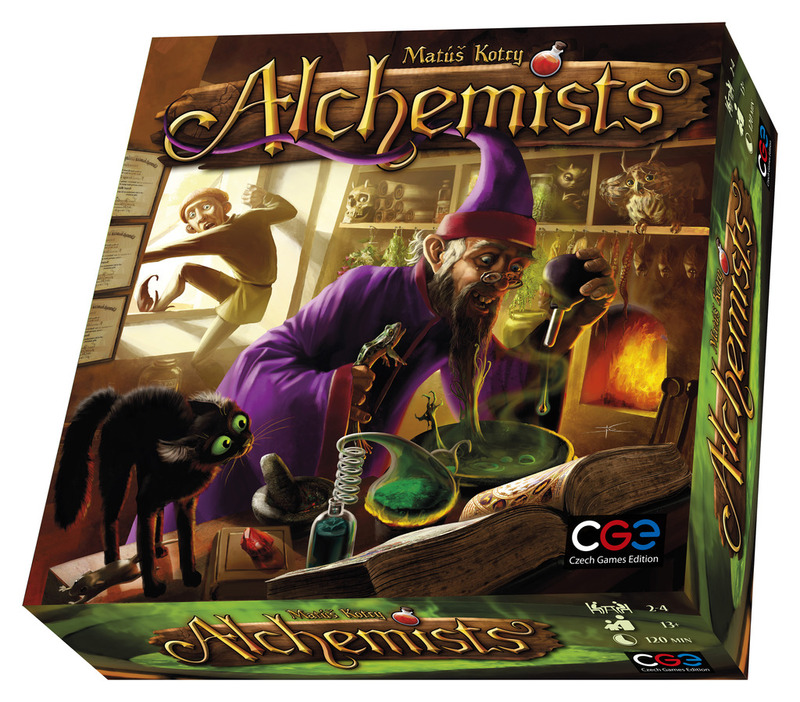 If board games with apps are going to be a thing, Alchemists really does point the way forward and give us cause for optimism.